Leslie Cliff was a dedicated member of the Canadian Dolphins Swim Club. Her career took off in the 1970’s, where she became a gold medalist in 1971 at the Pan American Games in the 200m IM, 400 IM and 4 x 100m medley relay. In 1972, she became not only an Olympian, but a silver medalist in the 400m IM and a finalist in the 4 x 100m medley relay at the games in Munich, Germany. 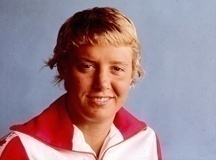 Furthermore, Leslie took part in two Commonwealth Games teams, where in 1974 she won gold in both the 200 and 400 IM. Over her career Leslie managed to hold an outstanding 16 long course National records as well as 12 short course National records. Winning was no stranger to Leslie. With 8 national appearances, Leslie competed in 52 finals, receiving an impressive 33 medals; 14 gold, 9 silver and 10 bronze. Above all the titles and medals Leslie won over her swimming career, Leslie was also inducted into the Canadian Olympic Hall of Fame in 1996.